Tissue Oil is well known for its remarkable benefits. It alleviates itchiness and dryness associated with skin ailments like eczema, dry psoriasis, acne, sun burn and more. It is an excellent moisturiser, helps with scarring and stretch marks, and is often used to treat and prevent acne. 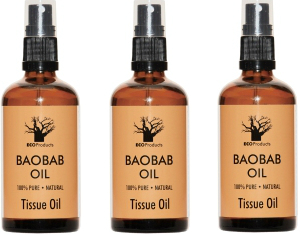 One of our favourites is EcoProducts’ Baobab Oil. It absorbs quickly into the skin without clogging pores, and really does leave your skin feeling soft and silky. Baobal Oil also contains Omega 3, 6 and 9 fatty acids which helps keep skin healthy. Apply the oil directly to affected areas, or simply add drops to your bath water, your regular body lotion, face cream or hair conditioner. And if you apply it to wet skin after your bath or shower, it will spread easily across your skin. This non toxic oil is safe even for children and pregnant women, although it is recommended that very light-skinned people not use it on their eyelids. We love that it is cold pressed, filtered, then bottled – no additives! We love that is is a local product. Find it at online stockists or from selected health stores and pharmacies. For more information visit the EcoProducts website. Three lucky readers can each win one bottle of Baobab Oil. I have been using it on my skin and it is just lovely, healing and soothing. Please send an email to melissa@lifeinbalance.co.za. Emails must have the title header – Baobab Oil. Closing date for entries is the 27th April 2014. The lucky readers are chosen via random number selection. Please only send one email per entry.